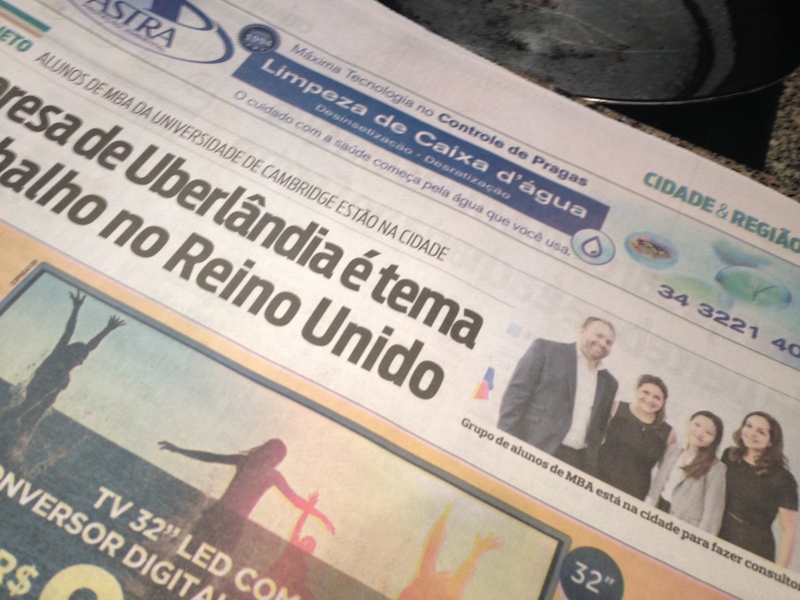 So what have we learnt here in Uberlandia by the second week of our project: firstly all restaurants charge for food by weight and Uberlandians party on Sundays (yes, Sunday). The language barrier still affects everything we do, but thanks to our client, we are provided with an amazing translator/consultant Fernanda who assists us throughout the project. Something unique to this week is that we went to Uberlandia’s agricultural fair to visit the client’s own exhibition, and got more of a flavour of the business environment that makes up this city of over 600,000 inhabitants. One thing which was emphasised back at the business school regarding the Global Consulting Project is the importance of team composition in projects: while there are elements that all team members should possess such as good attitude and interpersonal skills, diversification in terms of personality and skillset is crucial and the mix of those elements need to be right. I attribute our enjoyment of the project and our achievement of aims ahead of schedule to this great balanced team dynamic. Besides understanding the team’s own dynamics, we began to fully realise the extent of value we can add to the client’s business, and the team made sure we motivate each other to go above and beyond. We presented the list of final deliverables to the client and were told it goes beyond what was expected from us. We look forward with interest to seeing how far we can exceed our own expectations in week 3 and 4. In the meantime, a reward has been indulging in a weekend in Rio De Janeiro! During our second week on-site, we had the chance to speak with Kingdee’s CEO and meet with top executives to discuss their vision and strategy for the company. Many internal and external interviews and focus groups were also conducted, rendering our project increasingly high-profile within the company. Meanwhile, our team has been leveraging Cambridge University’s resources and databases to research case studies from which our client can benefit. With the additional insight gained from our activities, the project has slowly been taking shape. Many ideas have since emerged and been noted; the next challenge will be to consolidate them into a set of actionable and concrete recommendations, with solid evidence to support them. On an unrelated note, our team has also had the opportunity to facilitate an English-learning event for Vanke employees at their headquarters. Our teammate Ru Hao even became an impromptu MC for the event! It was a great opportunity to speak with locals and meet foreign professionals working in the area. For some of us, it was also a great educational experience that helped us polish our Chinese. Week two began with myself, Veena and Sham traveling to Merck’s HQ in Darmstadt, Germany. Most of Merck’s leadership team is flying to Barcelona for a series of important meetings over the next 10 days. Tuesday began with a vision for the brand’s future digital state, followed by a long brainstorming session around possible digital initiatives. However, we soon realised that we needed to filter and select our focus points from this list. In this way we laid out key strategic themes which set out the criteria and direction for us to choose and develop our concepts. The strategic themes were necessarily in line with the brand’s global and local objectives. We classified our chosen ideas into Essentials (basics), Essentials Plus (value-adds) and Differentiators. Now, we had to prioritise them. We chose to focus on essentials and three differentiator concepts for this week’s status update. Our aim was to detail the basic elements required to take the brand digital and prioritise one of the three differentiator concepts to develop deeper during week three. This week, our key stakeholder for the status update was Femibion’s Global Brand Director. Our week’s work was highly appreciated and some of the concepts were quite new to Merck. In today’s meeting, we came to know that Femibion’s brand team has already thought over one of our differentiator concepts which, thus, interested her the most. We will develop this concept further next week.